Western fever has hit the slots and the boys from the South are paying out well. Click here to play! Klondike Fever is an extremely simple to use slot machine that offers players a great chance at winning by paying out not only left to right, but right to left as well, thereby doubling your chances at winning! Playing across five reels and five pay lines, with the more coins played multiplying your cash payouts on winning hands, it is your job to spin up great combinations and win big! 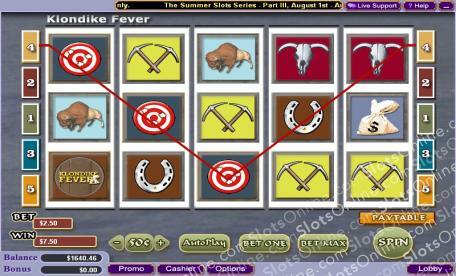 There are 24 unique winning combos with Horseshoes, Gold Picks, and Targets all playing a part in winning you cash. However, if you are keen on a big win then try your hand at spinning up five Klondike Fever symbols on any active pay line and you will find yourself with up to 10,000 times your original wager. Get out your spurs and head on down to Klondike Fever today for a cash jackpot worth its weight in gold!